1. In-vehicle lamp, if necessary, after separation can be used as a portable. 2. Press push button (1). 3. Pull out the lamp holder. 4. Press the power switch (2). 1. Remove the batteries when not in use for a long time. 2. Use the specified battery. 3.You can use the regular batteries (Disposable batteries) but do not use the Nonrechargeable battery in charge mode. It may damage the vehicle. 4. Do not place the lamp with water or moist places and liquid compounds. These can cause internal leakage of a battery. 5. 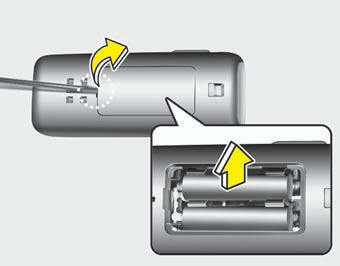 When replacing the batteries, check the direction and insert. It will not be charged if installed reversely. 6. Do not mix the rechargeable batteries. It may not be charged normally. 7. Do not place the lamp or batteries near fire or heat. It can cause internal leakage of a battery. 8. Do not apply electrical shock with portable charging terminals of the lamp. It can cause internal leakage of a battery or damage the portable lamp. 9. If the portable lamp does not turn on anymore after charged, replace the rechargeable batteries. 1. 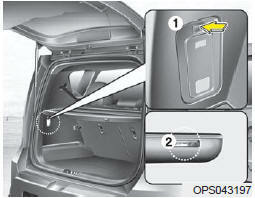 Insert a slim tool into the slot and gently try open the battery cover. 2. Replace the batteries with new rechargeable batteries (AAA size). When replacing the batteries, make sure the position of batteries. 3. Close the cover carefully.